So this week’s topic doesn’t have anything to do with Mason Jars, but how could I not talk about the total solar eclipse happening this month? The only tie-in I could think of was that we do carry Mason Jar solar lights that you can find here. But other than that, this is just a blog post about the solar eclipse because we’re really excited about it! Here are some fun facts about the solar eclipse and resources. If you’d like to know more, go to Astronomy Magazine’s website for the full list of fun facts. The total solar eclipse will happen on August 21st, 2017 This will be the first total solar eclipse in 38 years A solar eclipse is a lineup of the sun, moon, and earth A solar eclipse happens at New Moon Everyone in the continental U.S. will see at least a partial eclipse. First contact of the solar eclipse will be in Oregon This eclipse will be THE most viewed The city with the best and longest view is Nashville. Below is a list of some other cities that have some decent views. So some of us will get a decent look at this pretty big solar event. And they have verified these five manufacturers as credible: American Paper Optics, Baader Planetarium (AstroSolar Silver/Gold film only), Rainbow Symphony, Thousand Oaks Optical, and TSE 17. Click here for the full description and list. Here are some other resources for this rare celestial event happening in just a few weeks. More Nasa resources can be found here. It’s hot – everywhere right now! So, to help everyone cool off and hydrate, I thought I’d find some yummy flavored water recipes to share this week. These waters can be used for hydrating purposes, or as a detox from all the summer treats you’ve eaten. You can also use them to help aid weight loss or get glowing skin. No matter the reason you drink these waters, we all know the most important thing they do is hydrate. During these very hot summer months when we are outside lounging or exercising, we are sweating, which causes us to lose water. What better way to put back some of that water, but with some of these yummy fruit/veggie/herb infused water recipes. Take it up a notch with this watermelon and jalapeno infused water. You can find the full recipe here. Reader’s Digest is actually a great resource for fun and easy healthy eating and lifestyle habits. There are plenty of other Infused Water recipes there as well! Benefit: the capsaicin in the jalapeno has been shown to help provide pain relief and aid in weight loss. Check out Dr. Axe’s website for full benefits. Nourish and hydrate your skin with cucumber herb water. You can find the recipe here on the blog A Couple Cooks, along with some other great infused water combinations. Benefit: Cucumber is ultra-hydrating! Rosemary is a great anti-inflammatory, check out full benefits for rosemary here. Mocktail anyone? Try this blueberry/mint/lemon water that I found on Chelsweets blog. Benefit: Blueberries are full of cancer fighting antioxidants. Mint is great for digestion. Check out the full benefits for mint here. And for fruit infusing Mason Jar lids visit Mason Jar Lifestyle’s website. Because of course Mason Jars and infused water go together like peas and carrots! I don’t recommend that as an infused water though! Not only will you be saving money buying infused waters, but you will be reducing waste and reducing plastic use. Bonus….and being that it’s still plastic free July, double bonus!! We are half way through July. How is everyone doing with their plastic free goals? Hopefully you found some great alternatives and suggestions on the Plastic Free July website. I thought it was a great resource and definitely wanted to share it with you all. As July continues to speed by, I realized I have been doing great on my plastic free goals, but not so great on the healthy eating goals. I’ve been utilizing convenient eating way too often. With the higher temps and busy summer schedule it is easy to grab a quick bite at a drive through, or a sit down restaurant. I try and make healthy choices there, but it’s always better to cook your own food. I decided for the next few weeks I was going to do a gentle whole food detox. I’m doing this to help get me back on track with my healthy eating as I’m starting to feel a little sluggish and tired from more than just those 90+ degree days! A couple of my strategies when doing a detox like this is food prep! That is really the best advice for any dietary change. Food prep. Food prep. Food prep! Also, making a big salad for the whole week that I can bring for lunch, and have a small serving of before lunch. I go and pick out all my favorite produce and through it all together with a few of my favorite greens. If you are looking for a good detox salad recipe check out this one from Mind Body Green. Feel free to swap at anything or use it for inspiration for your own creation. I also make sure that I make my own dressings. Store bought dressings are either full of chemicals, or the better quality ones are way too expensive. For a few bucks in ingredients you can make an amazing healthy dressing. 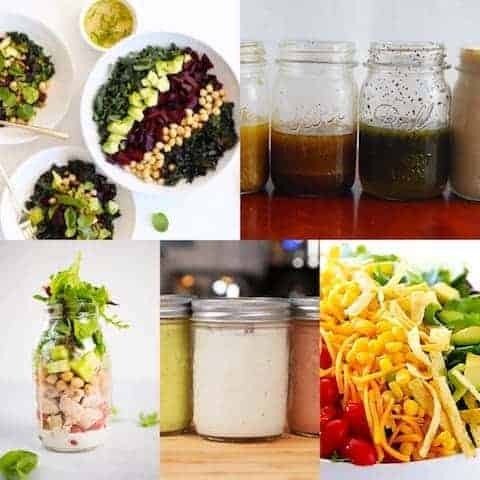 Last week we posted some really great basic salad dressings that you can of course make in a Mason Jar! My favorite is the basic Balsamic Vinegar dressing. It’s simple and does not mask the flavor of the veggies. I am looking forward to trying the ranch dressing. My daughters eat ranch on pretty much everything, and making this favorite will be much cheaper than buying the natural one I found for them! I love being able to dump all the ingredients in a Mason Jar, shake it up, and voila! yummy, healthy salad dressing! Here are the Mason Jar salad dressing recipes courtesy of Buzzfeed. Let us know which one was your favorite, and some of your tips and tricks for whole food detoxes. So many wonderful ideas to go plastic free this July, and I’m happy how much Mason jars play a part in most everyone’s strategy! Please go to Plastic Free July website to accept the #choosetorefusechallenge – you will find some solutions for going plastic free this month, and beyond. 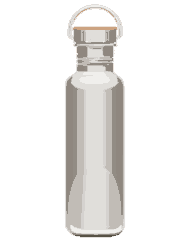 I suggest visiting the Case Studies section of the Plastic Free July website, as it offers many ideas for families, individuals, and workplaces to reduce your plastic use. And in the Toolbox section it gives you access to all the logos and badges to start your own campaigns or challenges! A lot of Mason Jar Lifestyles customers are interested in cooking and food storage ideas to go plastic free as was outlined in all the comments we collected from customers. 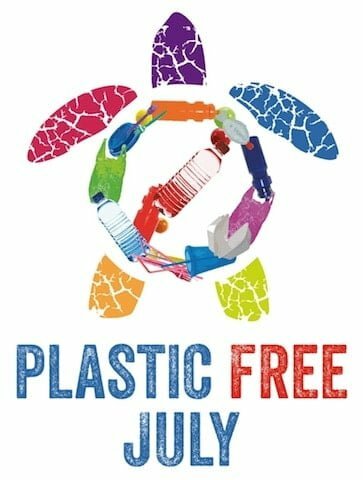 The Plastic Free July website has some great ideas outlined in their Living Plastic Free section – it offers up suggestions for all aspects of our lives. And once you get all your wonderful plastic free ideas head over to Mason Jar Lifestyle to bring those ideas to fruition! Is going “Plastic Free” on your family’s list to help the environment? Does it seem like a huge task? Well, I’m here to tell you that it is not! A big step is to stop using plastic straws. It’s as easy as that! According to an article in the Washington Post, half a billion plastic drinking straws are used in America everyday. If you carried your own reusable straws or only ate at restaurants that choose to use reusable straws, then you would be helping to decrease the amount of plastic that ends up in landfills and in the ocean. Wondering where you can get reusable straws and how you can carry them around? Mason Jar Lifestyle has the solution! We carry an array of reusable straws along with straw sleeves. These are easy to throw in your purse or stick in your pocket. Keep a set in your car, and you will be covered on the go. We’ve got everything–stainless steel, glass, silicone. These are a great way to work towards your goal of going plastic free! If you need a large number of straws for a party and don’t have enough reusable straws for everyone, consider using biodegradable paper ones rather than plastic. The oceans will thank you! To further your plastic free goal and expand it to styrofoam free, head over to the Surfrider’s website and check out their “Ocean Friendly Restaurant” movement. On this site, you will be able to find restaurants that limit or do not use plastic or styrofoam, along with some other environmentally-friendly criteria. It’s a great resource to help with your goal. Remember: Every little bit adds up and helps. With more and more people and restaurants having this same goal, we can all make a big impact! Here are a few other resources, courtesy of Surfrider Foundation. Father’s Day with Mason Jars! You might be wondering how you do Father’s Day with Mason Jars. Well, I’m glad you asked! Who has a Dad? Who has a Dad that is also a superhero fan…? If you answered “I do!” to these questions, then this Mason Jar craft is perfect for you. I found this on the fun site Sandy Toes and Popsicles. This is such a perfect craft to do with the kids! 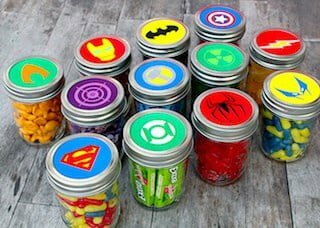 The kids will have a blast making these Mason Jars with all of Dad’s favorite snacks and his favorite Superheroes. Dad will be excited to eat all of those favorite snacks out of his favorite Superhero Mason Jars! If you’re not feeling the whole craft thing, then head over to Mason Jar Lifestyle and pick up a fun gift like our Faux Leather Mason Jar Cuff. It’s great for your morning coffee or a Moscow Mule on the patio on a beautiful summer’s day. Happy Father’s Day from all of us over at Mason Jar Lifestyle! Yesterday on Tuesday always has such great inspiration and crafts, and these Air Plant Mason Jars are just one of my favorites! It inspired me to share with all of you some amazing Mason Jar Air Plants and Terrarium ideas. With summer on the horizon, this is a great outdoor project to do with your kids because, let’s face it, it’s sometimes hard to compete with endless TV options and video games. These are great crafts to inspire creativity and spark your child’s love for the outdoors and nature! Yesterday on Tuesday’s Air Plant Mason Jar is a super cute way to help foster creativity and whimsy with your child. These are very easy to put together, and with the popularity of fairy gardens there are a lot of fun fairies and gnomes to choose from! Find the full directions and printable tags here. 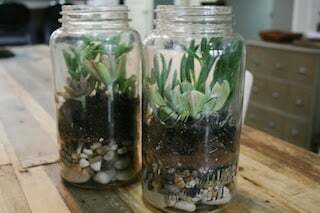 The Mason Jar Terrarium is great because you can either buy the supplies or have your kids go and hunt for them! I found a quick and easy DIY Mason Jar Terrarium on Blue Bonnet Press. Instructions are here. Succulents are super hot right now, so you can find the real deal or fake us all out with the plastic versions. Now go outside and get dirty! And don’t forget to check out Mason Jar Lifestyle for all of your Mason Jar accessories and decor. Happy Graduation from Mason Jar Lifestyle! Graduations are in full swing, and we here at Mason Jar Lifestyle would like to raise a Mason jar to all of the graduates! Graduations are a time of celebration and reflection on all the hard work it took to get to this joyous moment. You made it! Here is a great Mason jar craft to make to give away as gifts, or use as centerpieces for your tablescapes. I found this great craft on Jamie Lane’s blog, and you can find the full post here. So cute and so fun to create! 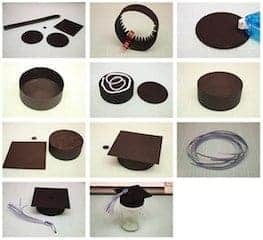 3D Mason Jar Graduation Hat This 3D Graduation Hat fits a Pint Size Mason Jar or any item with less than a 3″ diameter. The file comes with the pieces to create the hat as well as the tassel. All the pieces are compatible with both the 8×12 and 12×12 mats. You can fill your jars with money for gifts or fill with candy and use these as centerpieces for your tables! 1. Cut out the hat pieces. Fold the tabs on the score line. 2. Place glue on the side tab and adhere to the other side. 3. Place adhesive on the edge of one of the circles. 4. Place the tabs down toward your table and then place the circle, adhesive side down, on the tabs. 5. Turn the piece over and place adhesive all over the back side. 6. Adhere the last circle in place to cover all the tabs. 7. Place adhesive on top of the circle. 8. Adhere the square in the center. Place a small foam adhesive on the little circle. 9. Cut out the tassel strips in your school colors. 10. Fold the strips in half and tie a piece of twine around the folded end as shown. 11. Adhere the small circle in the center of the square and loop the tassel around, curving the ends. This craft is a great way to incorporate your favorite thing (a Mason Jar) into the festivities! Make sure to tag us when you make these little beauties for your Grad on Instagram or Facebook. And to your family from ours CONGRATULATIONS!!! One of our founders Maggie with her cousin, who is now in her third year at the University of Utah! This was a recipe my mother put in a 1950s church cookbook. The original recipe called for 2 cups sugar, which is way too much. I have been told by a few people that back in the 1950s the sugar companies advertised sugar as something healthy that gave you good energy, and parents were encouraged to give you lots of it, which is why we have all those fillings in our teeth now. I think this is what adults drank before Arnold Palmer became famous and people started ordering his eponymous drink. I don’t actually remember drinking it much. Fresh lemons were not that plentiful back then, so they were saved for the adults or special occasions, and we children were served Kool-Aid (with lots of sugar, of course). Most kitchens had those green jars of lemon and lime juice in their refrigerators, something I never buy now. My sister Ruth always had this recipe along with her during all the years she spent on the African continent, as she could get tea and lemons but not the variety of cold drinks we have here. She reintroduced it to us about the same time I started using Mason jars for more things, so I like to keep this tea in a quart jar with the gray lid seen in the photos. Pour 2 cups boiling water over 3 tea bags and let steep 15 minutes. Pour tea over 1 cup sugar to which the grated zest of 3 lemons has been added. Let mixture stand 15 minutes. Add the juice of the 3 lemons. Strain. Pour into a quart Mason Jar. glass, depending on strength desired. Celebrating mothers has been around for a very long time, but it was not made an official holiday until 1914 by Anna Jarvis. Before it became the secular holiday it is today, it was celebrated during Lent and was the time you went back to your, “mother church.” Interesting fact, but I’m glad we’ve incorporated focusing on moms a little more because, let’s face it, they do a lot for us! Moms not only wipe away the tears and kiss our boo boo’s, but they make sure our lives run as smoothly as possible. Sometimes they do their job so well we don’t even see what a hot mess our lives would be without mom. Moms are constantly seeing and doing so that she can be one step ahead of her family. Sound exhausting? It is. And because of that, moms deserve some downtime, some decompression time, some self care to help her fill her cup back up. I’m inclined to say that mom needs more than one day, but let’s just make sure that her official day is one of the best! A good start is to make sure she has plenty of time for herself (while she enjoys your thoughtful gifts). 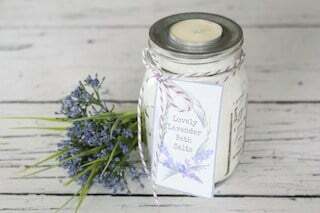 The best thoughtful gift is a homemade gift, and the perfect homemade gift is Lavender Bath Salts! Even better: enter mom in the $50 Mason Jar Lifestyle gift card giveaway through Yesterday on Tuesday. Let’s break all this wonderfulness down. And here are the printable labels courtesy of YoT. You can also find them here. Happy Mother’s Day from MJL to all the Mother’s out there!